Under the pontificate of Khoren I, the Catholicosate went through an era of achievements in various domains. Through his strenuous efforts the Catholicosate reached financial stability; the terrain of the Catholicosate was expanded and new constructions came to meet the growing needs of the Catholicosate. In 1977, Catholicos Khoren wished to have a Coadjutor to assist him. Archbishop Karekin II Sarkissian, the Primate of the Eastern Prelacy of the USA, was elected Coadjutor-Catholicos. Although 18 years of his Pontificate were difficult years in Lebanon because of the civil war, Catholicos Karekin II succeeded in elevatating the Catholicosate of Cilicia to a new level of witness and service. He improved the printing house, restarted the publication of the annual “HASK Armenological”, established the Christian Education Department, organized seminars on contemporary issues, and enlarged the scope of the ecumenical involvement of the Catholicosate. In April of 1995 Catholicos Karekin II was elected Catholicos of All Armenians in Etchmiadzin, Armenia. 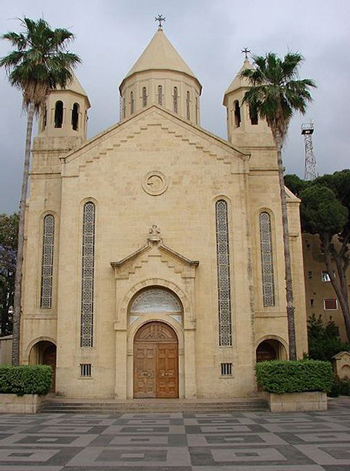 In June of 1995, Archbishop Aram Keshishian, the Primate of the Armenian Church in Lebanon, was elected Catholicos of Cilicia by an Electoral Assembly composed of 185 clergy and lay delegates. The Armenian Catholicosate of Cilicia is rightly described as a dynamic and committed witness to the Gospel. This witness has incorporated various dimensions and domains of the life of the Armenian Church and people. It is important to identify some of the major ones. Throughout its history, and especially in difficult times, the Catholicosate of Cilicia has played a leading role in the life of the Armenian people, particularly in the educational, cultural, and social spheres. After the Armenian Genocide, it brought an important contribution to the formation and the organization of the world-wide Armenian Diaspora. Being itself a victim of the Armenian Genocide, the Cilician Catholicosate has been active in promoting human rights and, in that context, the rights of its people in international circles. It has also significantly helped build awareness in the life of the new generation concerning this crime against humanity. The Catholicosate has equally contributed to the development of social service. In fact, not only has it encouraged the involvement of the Church in social diakonia at the diocesan level; it has also initiated important social projects that touch the daily life of the people such as orphanage, hospital, community centers, etc. The popular housing projects and the Old Peoples’ homes in Lebanon, Syria, and Greece, are directly administered by the Catholicosate. The pivotal role of the Cilician Catholicosate in the cultural life of the Armenian Diaspora deserves special attention. Each year, the publishing house of the Catholicosate publishes hundreds of titles; many publication funds have been established. Book exhibits and fairs, as well as an important number of conferences, debates, seminars, cultural meetings, and concerts are organized annually. In addition to these important initiatives, the construction of a Museum and the establishment of an important Library with more than 100,000 books are, indeed, eloquent manifestations of the growing involvement of the Catholicosate in the promotion of spiritual, moral, and cultural values in the life of our people. The Theological Seminary has been regarded as the backbone of the Catholicosate. Christian Education is increasingly becoming a vital area of profound concern for the Armenian Church. The department of Christian education is organizing on a regular basis seminars on the Christian formation of laity, Bible study courses, and people-oriented activities aimed at spiritual renewal of the Church. In fact, Christian education in the families, schools, and Sunday schools is organized mainly through audio-visual materials and publications. Women and youth are an integral part of the Christian witness of the Catholicosate. Through the Association of University Students, church-related ladies guilds, and other youth and women organizations and movements, they are promoting Christian values and making them more active in the life and mission of the Church. Ecumenism has always been a priority for the Armenian Catholicosate of Cilicia. The ecumenical engagement of the Catholicosate was given a more organized form after 1962, when it became a member of the World Council of Churches (WCC). At the 7th Assembly of the WCC in Canberra (Australia) 1991, His Holiness Aram I, then Archbishop, was elected Moderator of the Central and Executive Committees. His Holiness was unanimously re-elected at the 8th Assembly in December 1998 in Harare (Zimbabwe). The Catholicosate sent observers to the Second Vatican Council. The visits of the Catholicoi to Popes, as well as joint declarations and meetings with representatives of the Roman Catholic Church, greatly enhanced the centuries-old relations between the Armenian Catholicosate of Cilicia and the Roman Catholic Church on international, regional, and local levels. The relations of the Catholicosate with the Churches of the Middle East have always been fraternal. As one of the initiators of the ecumenical movement in the region, the Catholicosate took an active part in the foundation of the Middle East Council of Churches in 1974. The Catholicosate has played a key role in promoting theological dialogue between the Eastern and Oriental Orthodox Churches. It has been instrumental in the development of the more organized collaboration among the Oriental Orthodox Churches, particularly after the meeting of the Heads of these Churches in Addis Ababa in 1965. The Catholicosate of Cilicia continues, with growing impetus, its ecumenical relations with the Anglican Church and other Churches and World Communions as well as with various ecumenical organizations. 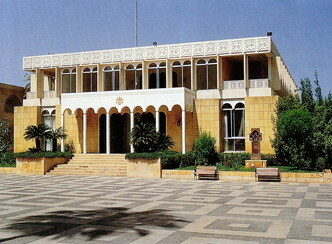 Having its headquarters in the Arab wo rld, and being an integral part of the Middle Eastern society, the Catholicosate of Cilicia participates in the major events of this region. Being a firm believer and a defender of co-existence and dialogue, the Catholicosate of Cilicia has always extended its active and strong support to all efforts aimed at strengthening a shared and harmonious common life among religions, societies, cultures, and civilizations in different parts of the world in general, and in the Middle East in particular. These areas briefly outlined above, remain a priority for the witness and service of the Armenian Catholicosate of Cilicia. 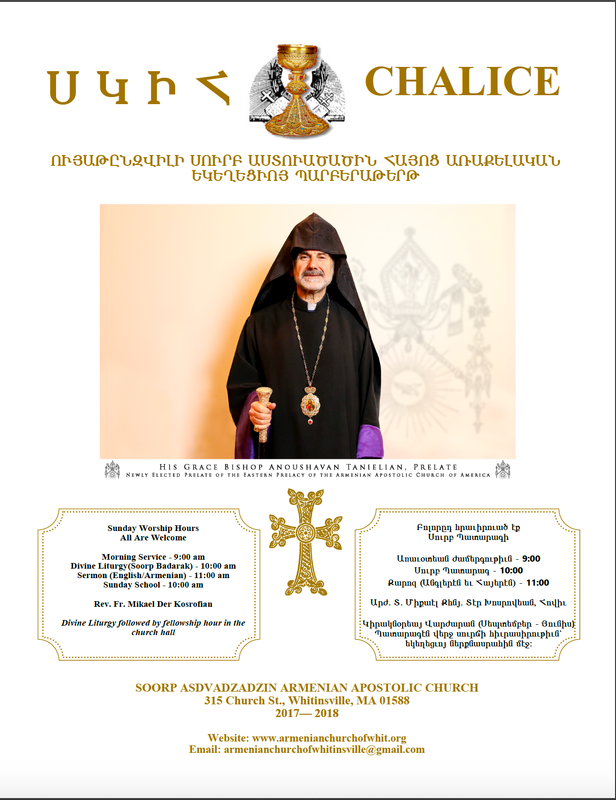 His Holiess Aram I, with his world-wide ecumenical experience, spiritual and intellectual insights and pastoral zeal, has given a new emphasis and articulation to the witness of the Armenian Catholicosate of Cilicia. In fact, preparation of young leadership, both clergy and laity, re-organization of the missionary, evangelistic, pastoral, and educational vocation of the Church (by making it more responsive to the new needs and challenges) and re-commitment of the Church to the ecumenical movement have acquired a decisive importance in the Pontifical ministry of His Holiness Aram I.